I’ve long been a fan of Edward G. Robinson—he’s been a fixture for gangster movies for many years, such as the villainous Johnny Rocco in Key Largo, one of the villains in The Ten Commandments, but he’s a much more versatile actor than that; and he proves that here in Mr. Winkle Goes to War. In this movie, Edgar G. Robinson plays the title role—a quiet bank teller, who hates his job and longs to work with his hands and produce things of value. Early in the film, he finally quits his job in order to start a small fix-it shop out of his garage, a dream that he’s held for years. His wife, however, will have none of it, and insists that he return to his job. And avoid hurting their “image” among their friends. 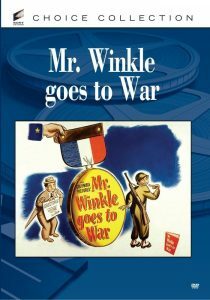 Before the point can be resolved, Mr. Winkle is drafted to serve in World War II. Although an older man, approximately 40, Mr. Winkle goes to basic training and is willing to do his part for the Allied effort—but is broken-hearted when the Army wants to use him as a bookkeeper again. Mr. Winkle believes that he can be more useful as a mechanic, and even follows his sergeant into town to plead his case. Eventually, Mr. Winkle wins his chance to be a mechanic, proving his willingness to successfully complete the tougher training required, and eventually becoming a mechanic. Back home, his wife is having trouble understanding her husband, and several vignettes of the orphan boy that Mr. Winkle has befriended reading Mr. Winkle’s letters home to his neighborhood friends help to set the stage for the emotional underpinning—and then Mr. Winkle is injured while in the line of duty. Mr. Winkle Goes to War serves as a patriotic film, but it’s frankly more powerful as a character study. In addition to the vignettes with the orphan boy, another recurring theme is the song Oh, Genevieve that Mr. Winkle first plays in his shop, reminding him of his love for his wife, and later again at boot camp. The only negative thing that I have to say is that, unfortunately Mr. Winkle Goes to War isn’t available on DVD at this time. I was fortunate to see it being played on Turner Classic Movies, and recommend it.